Located in Des Moines, IA, Drake University is a great location for an adidas Tennis Camps. Directed by head coach Mai-Ly Tran, campers will train on the 6 outdoor and 6 indoor tennis facility at Drake University. Day Campers: Check in for all campers Mon-Thurs 9am at the courts. Check out for day campers 4pm and for half day campers at 12pm. Mai-Ly Tran was named head women’s tennis coach at Drake University on Wednesday, July 27 2016. 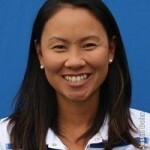 Tran comes to Drake from Cal State Fullerton, where she spent the last three years as assistant women’s tennis coach. She helped lead the Titans to a 35-33 overall record the past three seasons, while also compiling nine Big West Conference awards, six Big West Player of the honors and 11 Big West All-Academic accolades. Tran tutored Alexis Valenzuela, who was three-time Big West singles first-team selection and the first Titan to earn first-team honors in program history. This past spring, Valenzuela and doubles partner Camille De Leon became the second Titan duo to receive first-team All-Big West honors. Tran’s tireless work over the last three seasons resulted in the best season in program history in 2016 with 17 wins and the Titans’ first winning season since 2004. Prior to her stint at Cal State Fullerton, Tran served as the Director of Tennis at Hope International University before coaching four years at Orange Lutheran High School. Tran played for Cal State Fullerton from 2004-07 and accumulated 38 wins during her career. As a senior, she earned all-Big West second-team honors with her doubles partner Gina Le.